Harald is a Nord miner who works inside Quicksilver Mine in Dawnstar. He is named in Azarain's Journal as a possible member of a Daedric cult, although it is eventually revealed that he is a vampire's thrall, under the control of Fenrik. 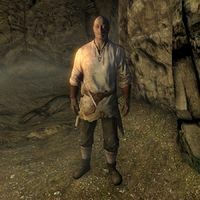 You will be tasked with pickpocketing or following Harald during the related quest to see if he will lead you to the Daedric cult. If you try to pickpocket him, you will discover that he carries an enchanted Elven dagger and some bloody rags, which will update your journal. If you follow him at night, he will use a button at the back of Quicksilver Mine to enter a hidden chamber dedicated to Molag Bal. Upon discovering this, you will be tasked with killing Fenrik and his other thralls, and Harald will attack you. This page was last modified on 20 January 2019, at 19:10.